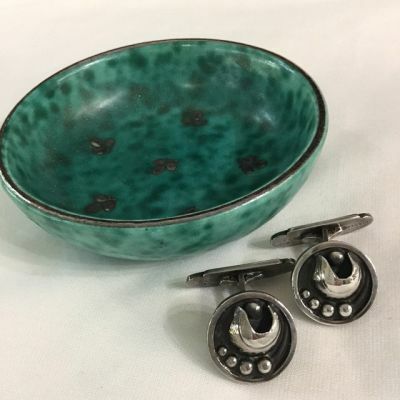 Art Deco Gustavsberg stoneware dish and sterling silver cufflinks. The Gustavsberg dish is in the "Argenta" pattern, made with silver overlay. Vintage sterling silver cufflinks, marked Sterling Denmark, E & M 415. E & M is the mark for Eiler & Marloe, a prolific Danish mid-century jewellery manufacturer.